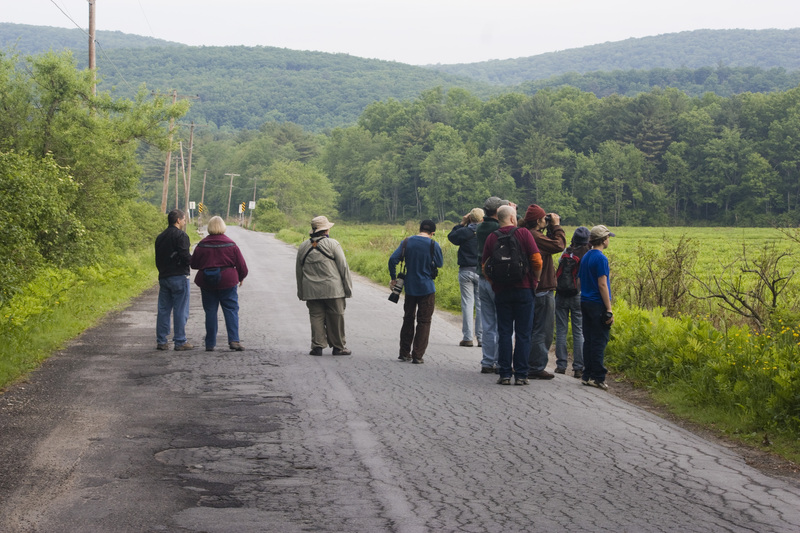 This morning, the NYS Young Birders Club went to Sullivan County, NY for our May field trip. Our destination, the Bashakill, is probably the best birding spot in the county and can be terrific for migrants during the spring and fall. I and two particularly intrepid young birders camped (with a parent) nearby so we could start early. So, my alarm went off at 3:30 am, and we were on Haven Rd listening for birds by 4:10. The frogs were deafening, making it hard to hear anything in the marsh, but we soon picked out Swamp Sparrow, Eastern Kingbird and Tree Swallow from the din. Soon after, an American Bittern began its characteristic deep “oong-KA-chunk” call. Because the frogs were so loud, there was some discussion with our trip leader, Lance (a superb leader, by the way), about trying a certain road nearby known for Whip-poor-wills. We decided it might be worth it. We started back toward the cars, only to stop halfway because, you guessed it, a Whip-poor-will was calling somewhere in the valley. How convenient. It was getting light now. Wood Ducks flew by in small groups, and a small flock of Bobolinks passed over our heads. A Common Moorhen called to the north (we luckily got to see it too), and Northern Rough-winged Swallows joined the Tree Swallows already in the air. The rest of our group arrived by 6, and we headed off to a nearby trail, the “Stop Sign Trail”, to look for migrant warblers and other songbirds. 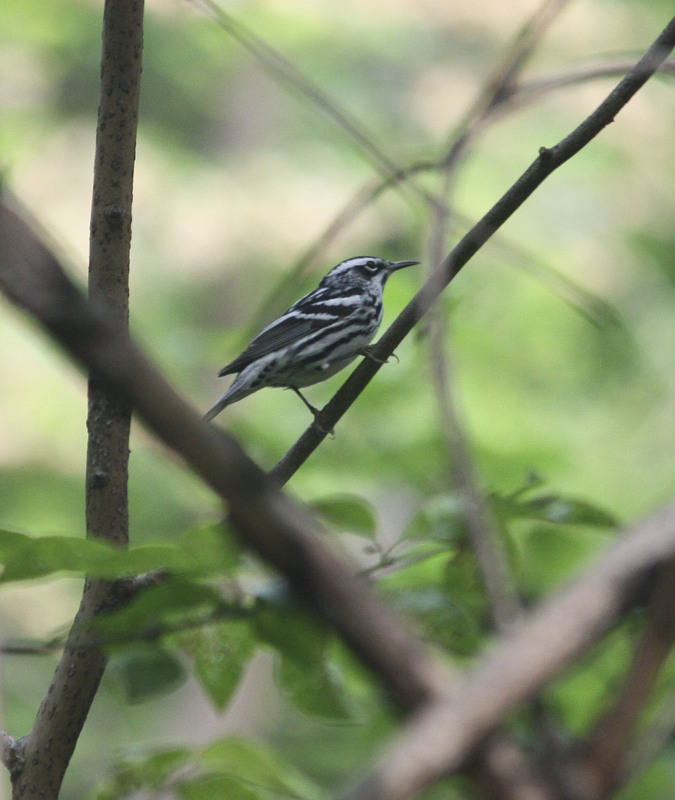 Blackpoll, Black-and-white and Yellow Warblers, plus Northern Waterthrush, were all around, but nothing compared to the loads of migrants present in the days before. It seemed as though nearly all the migrants had left the night before we arrived. A flyby Pileated Woodpecker did lift the mood a bit. Lance told us not to worry, and we moved on to another area, the Nature Trail section of the Bashakill. Though there were not as many migrants here as well, there were some — Veerys and a Gray-cheeked Thrush sang as we walked in, and Canada and Wilson’s Warblers each made an appearance, among others. 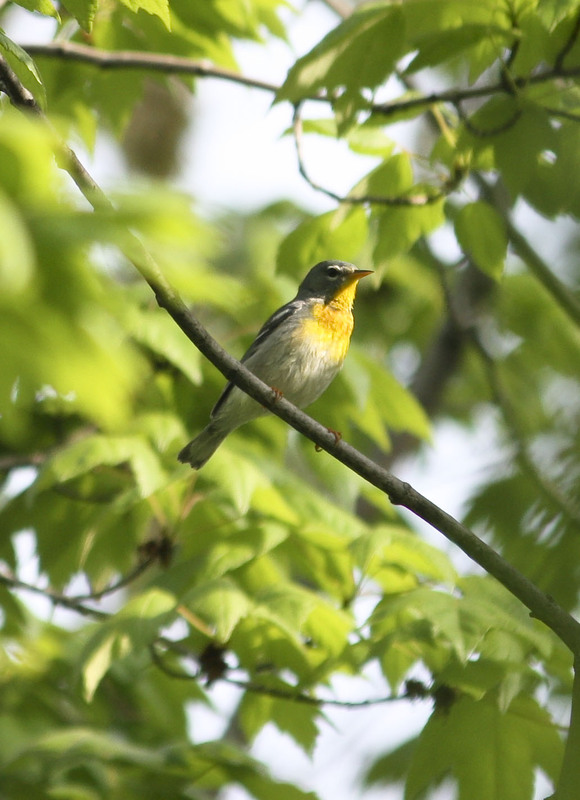 A Northern Parula, one of the dozens of warblers I saw today in Central Park. First, I must apologize for my one-month hiatus from posting. It’s not that I didn’t bird, but that the birding I did was pretty normal, and I didn’t get any good photos. Now that it’s May, though, well, the migrant floodgates have opened! Today I spent no less than six hours birding in New York City’s famed Central Park, probably the best spot to view warblers in the northeast. Why, you ask? Well, at dawn, all the migrants flying that are caught out over the city (i.e. no habitat) head toward the only green in town – Central Park. Because of this, during May the park is often saturated with migrants. Today I started birding at 7 with a group from Hudson River Audubon, and, though the group got off to a slow start, we finished the day with some really good birds. 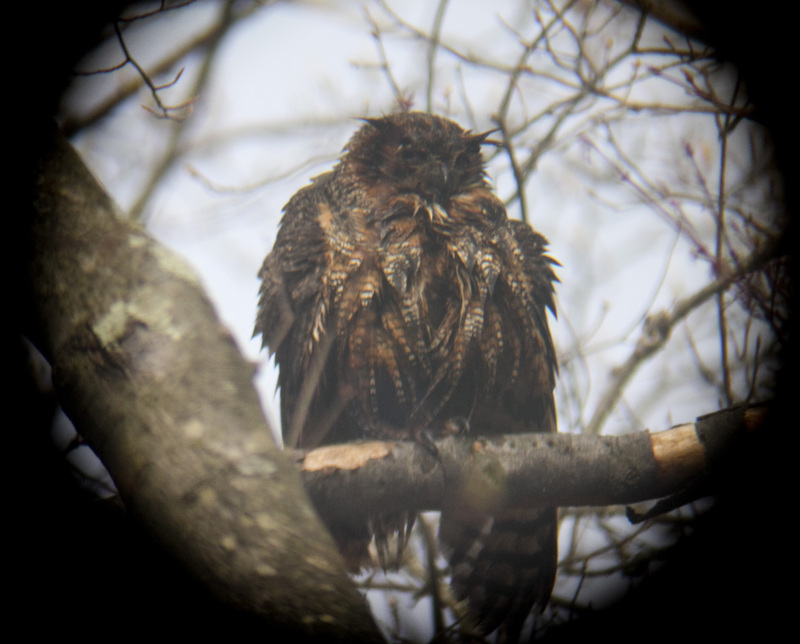 A male Cape May drying itself off after taking a bath. Prairie – A few, some viewed well. I love their song. Blackpoll – Lots, heard everywhere we went. They’re surprisingly early, not usually seen in large numbers until mid-May. And that wasn’t even the end! 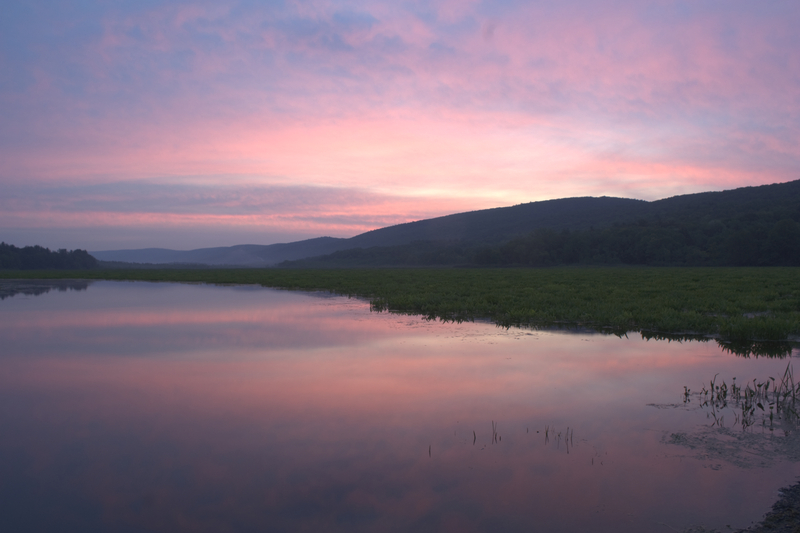 Marshlands Conservancy is the largest saltwater marsh in Westchester county and one of the only in New York open to the public — therefore it should come as no surprise that it is one of the best birding spots in the county. It’s the beginning of April, and there were some interesting birds around despite the early date. Some migrants that had just arrived in the past week or so included Eastern Towhee, Pine Warbler, and Palm Warbler, a year bird for me. Field Sparrows were singing, and American Robins were absolutely everywhere. I checked all the sparrows that popped into view by the marsh, but all of them were Song Sparrows. Down at the water not many waterfowl came into view besides Red-breasted Mergansers and two Bufflehead. We then reached Parson’s Island on the southeast side of the sanctuary. 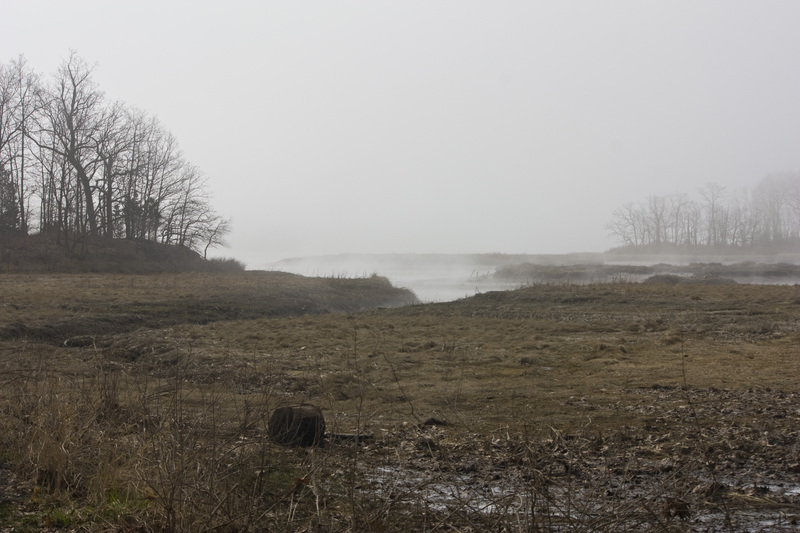 One of the best spots in the preserve, the marsh surrounding the island supports rails, marsh sparrows, and Marsh Wrens in the spring/summer/fall months, and views of the channel that leads to the Long Island sound often produce shorebirds, gulls, terns, and waterfowl. I was hoping to pick something good out; indeed, as soon as I stepped foot onto the island I heard a Clapper Rail calling from within the marsh. Red-winged Blackbirds displayed above the wet grasses, Killdeer called overhead, and an American Oystercatcher called from a large rock in the water. I then started scanning the flats for shorebirds. It was 10:30 am, exactly low tide, and two groups of 3 Greater Yellowlegs were visible searching for food. But then the fog rolled in. After a couple minutes it became hard to make out the birds on the other side of the channel, and not too long after it became impossible to see more than 50 feet toward the water. 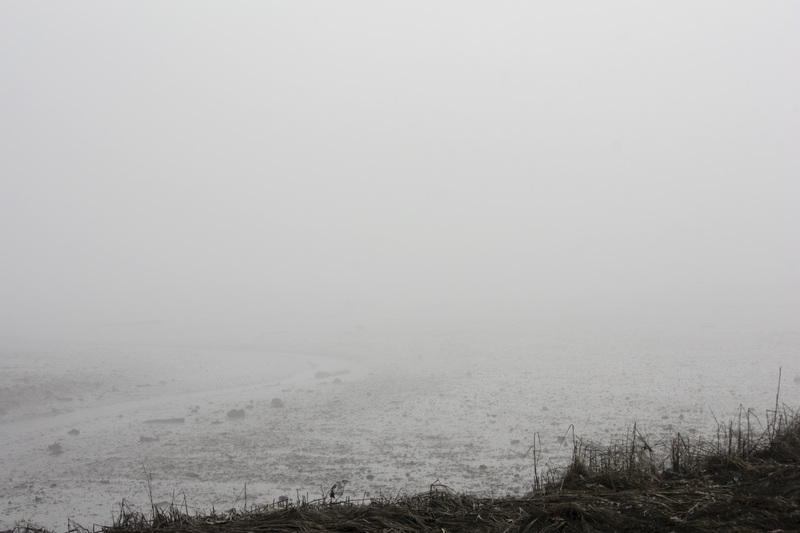 We waited around to see if the fog would lift, but after 20 minutes we decided to call it a day. The birding wasn’t bad for the first few days of April. It’s finally the beginning April, but today it felt like it’s quite a bit later. Not just that the temperature almost reached 70 degrees (and parts of New York are forecast to be over 80 degrees tomorrow), but the birds as well. The continental doppler radar reflectivity mosaic for midnight last night. The above is a mosaic of targets detected by continental United States doppler weather radars at midnight last night. For those unfamiliar with how to interpret this image, basically all of the blue circular blobs represent birds migrating over doppler radar stations. The darker the blue, the more dense the migration. The reason that the whole surface of the eastern continent is not covered by blue is that these radars are inclined at an angle, so as the beam gets farther away from the station, it samples higher altitudes. Therefore, after the beam gets high enough to get past the layer of migrating birds, the blue stops, explaining the circular pattern around each radar. There is some precipitation scattered around the map (the noncircular formations with green mixed in), mostly in the Dakotas, Nebraska, and Kansas. Using doppler radar to gauge bird migration is a wonderful tool, and it can even be used to “forecast” new waves of migrants moving into our area. A word of caution, though — just because there are lots of birds flying over doesn’t mean they will land at your nearest hotspot. More on this in a future post. It is obvious from looking at this image that the whole of the eastern seaboard experienced a relatively dense migration event for the time of year last night, perhaps spurred on by the high temperatures. 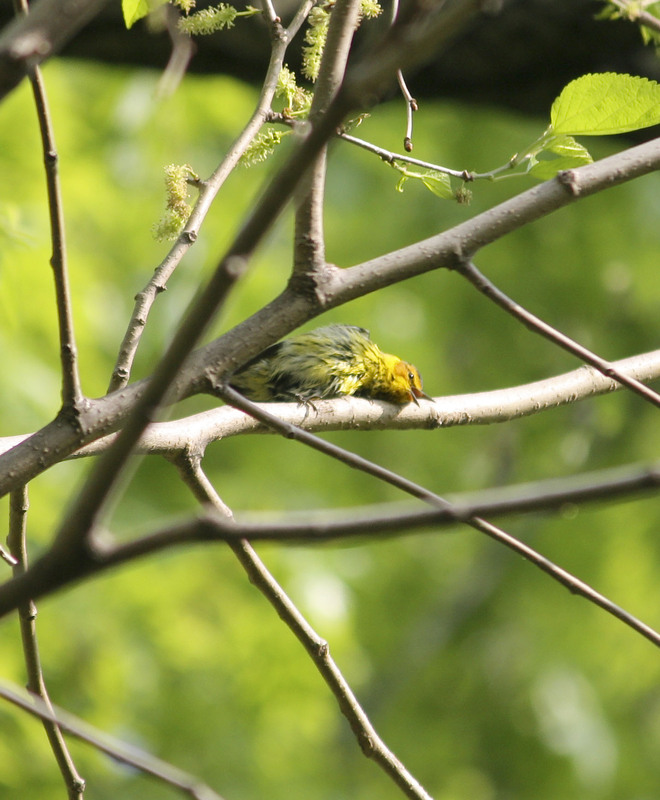 A flurry of early records from around the Northeast supports this, such as a few sightings of Prothonotary Warblers and White-eyed Vireos, birds that don’t normally occur in our region for a few more weeks at least. Even though Long Island doesn’t appear to have been much in on the action (not much blue) last night, I headed down there anyway to do some birding. 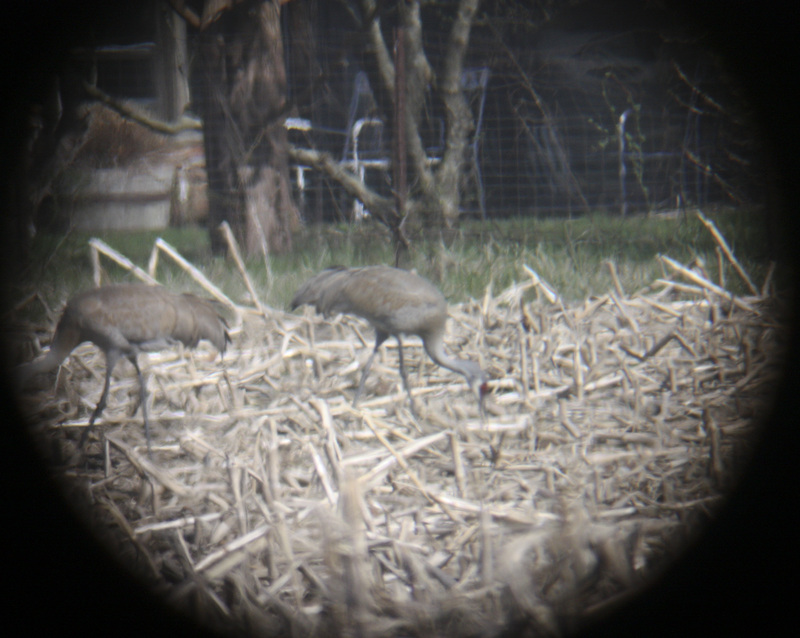 Sandhill Crane is a western species that seems to have established a tiny foothold in the northeast. A handful of individuals are reported each year during migration, and there are a few known breeding areas in the region. The Quaker Ridge Hawk Watch, in Greenwich, CT, tallied no less than 9 Sandhill Cranes last fall flying by the watch, and there have been reports in at least Connecticut and New York this spring. One of those reports comprises 2 cranes hanging out in cornfields around Sagaponack, NY, out on the east end of Long Island. That’s where the first stop was today. This morning, the New York State Young Birders Club (NYSYBC) journeyed to Stockport Flats, a series of freshwater tidal wetlands in Columbia county, south of Albany. 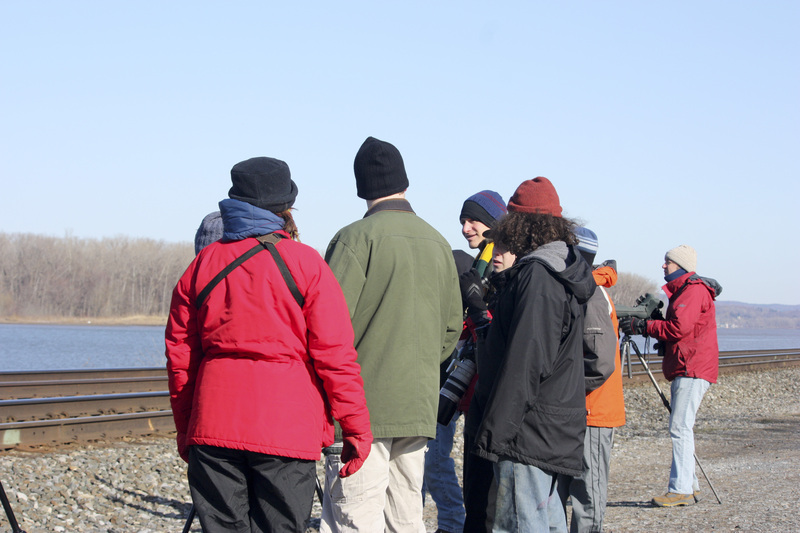 Seven young birders and a few adults were accompanied by our leader, Bill Cook, of the Alan Devoe Bird Club. The group talks after scanning the river. March is a tough month for birding in the northeast. The majority of winter residents have begun their return to the breeding grounds, but, save for a few early migrants, northbound migration from South and Central America hasn’t yet begun. Today, we were hoping for a bit of both worlds. This past Friday, Brendan and I decided to venture upstate a ways to try and pick up three species – Upland Sandpiper, Grasshopper Sparrow, and Sedge Wren, which was recently reported and is a bit east of its normal range. We got to Benedict Park in Montgomery, NY around 9:10 and immediately heard Grasshopper Sparrows from the car. Upon arriving at the parking lot a few dozen meters down the road, Brendan heard the Sedge Wren singing, and sure enough, after we started walking the path, the wren fluttered across about a hundred feet down. We stayed a while to get better looks and pictures (mine came out terribly), and we got great scope looks at a Grasshopper Sparrow. Also there were Meadowlark, Bobolink, Savannah Sparrow, and the usual host of grassland birds. 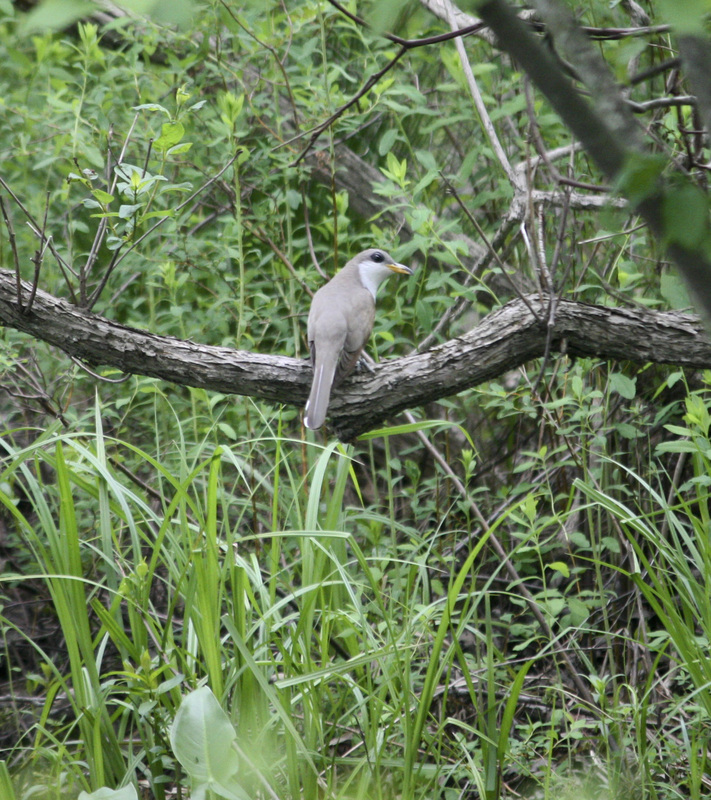 Somewhat unexpectedly, we heard a Black-billed Cuckoo, another life bird for me! 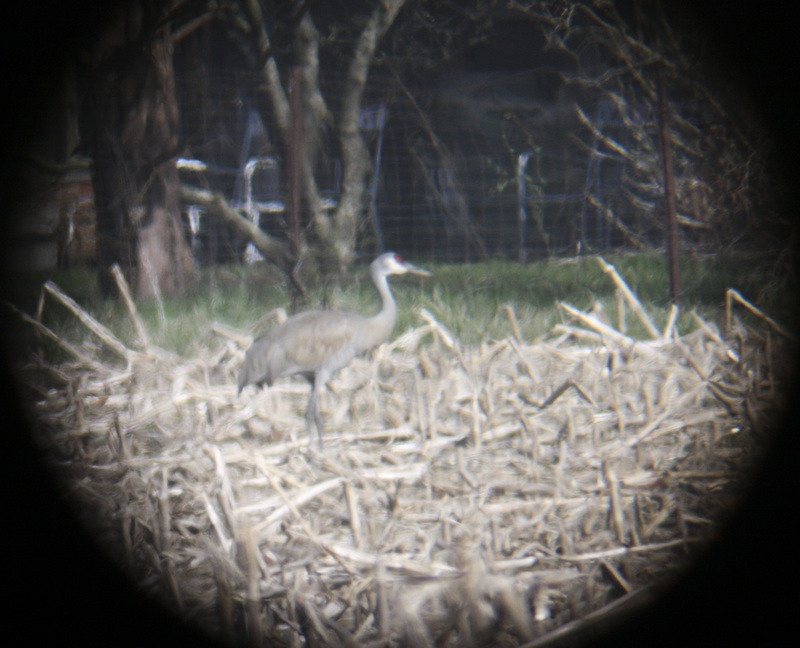 My unsuccessful attempt to digiscope an Upland. Shawangunk Grasslands. So for 3 for 2 , we left Benedict and headed to the Shawangunk Grasslands area, about 20 minutes north. After combing nearby Blue Chip Farms unsuccessfully for Upland Sandpiper, we headed to our backup spot, the parking lot of the Town of Shawangunk Park on the other side of the grasslands. Within minutes, I spotted an Upland sitting on a signpost, which was joined by another shortly as they both leisurely flew from perch to perch and stuck around for a long while, still there when we left about a half hour later. Brendan and I both tried to digiscope some photos, the result not being too good. Regardless, I haven’t had a 4-lifer day in a long time, and the ease of finding the birds was a real treat. Life list: 278; Year list: 219; NY list: 196. Veerys were everywhere. This one in Cornwall, CT. This was honestly the best time birding I’ve had – for those who don’t know the world series is 24 hours straight of birding from midnight to midnight within (but allllllll over) the state of New Jersey. The team with the most species at 12am on Saturday night is the winner. My team, the Razorbills, finished 3rd in youth and 12th overall with 176 species. The winning youth team got 211 and adult team 229. We had a decent pre-dawn, but unfortunately there were a few hours of on and off rain up until dawn, so we started off behind schedule. Luckily, we were able to cut some stops out of the route that hadn’t been productive during scouting, and finished the morning with 131 species – 10 higher than what the winning youth team had at that time during the day. However, a lack of scouting time in the South (we could only rely on others’ reports – school is hard to take off from) combined with some bad luck, prevented us from keeping up the pace we had set in the morning. Still, we finished the day with 176 species and some great memories! Golden-winged Warbler singing, Sterling Forest State Park. Female American Redstart gathering nexting material. 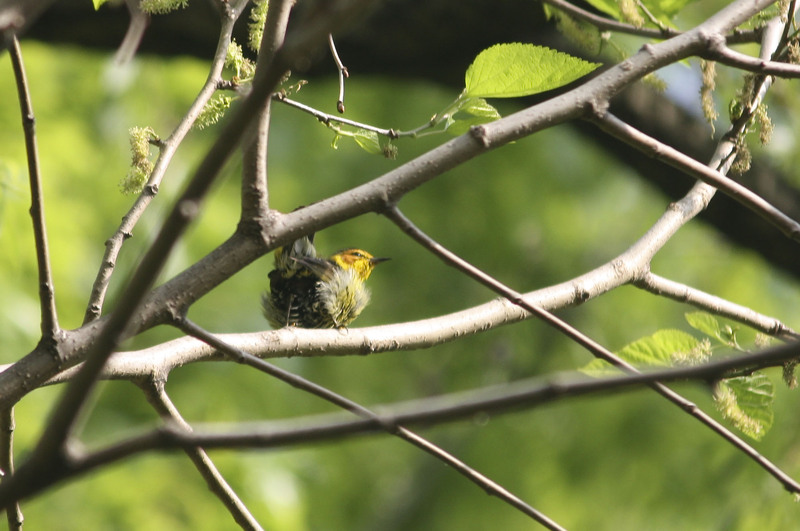 Cornwall, CT.
My family usually takes a trip on Memorial Day weekend to Cornwall, CT. Luckily, right nearby (well, 30 minutes away) is River Rd, one of the only places in the state to see Cerulean Warblers (or should I say hear Cerulean Warblers). We heard them all the time – I think the total was about 7 or 8 – but I only saw them once or twice. Other warblers (12 sp.) included Blue-winged, Blackpoll, Blackburnian, Worm-eating, and Louisiana Waterthrush. There were a few Spotted Sandpipers on the sandbars and some Common Mergansers on the river. I didn’t know about the nesting Cliff Swallows…that’ll be next year. The real surprise came when we decided to take a road that branched off of River Rd (N. Goshen Rd), and it ended up taking us past this school (unexpected) and by these grasslands with tons of Bobolink. One even landed 10 feet away but my camera decided to focus on the bush instead if the bird, and then it flew away. At the house in Cornwall, I had the same number of species and more warblers (51 total, 13 warblers – but no Ceruleans). The breeding Louisiana Waterthrushes behind the house have returned, and there was a Black-throated Green singed persistantly all day whom I suspect was breeding. Same with Blue-winged, Magnolia, and a host of others. A nice Blackburnian moved around the property a lot singing the unmated-type song (sort of sounds like B&W), and the calling of a Yellow-billed Cuckoo was a nice surprise, as well as an early Common Nighthawk. No Mourning Wablers though, which I had been hoping for. I did have three empids (small flycatchers that look almost identical and best differentiated by song) though – Alder, Acadian, and Least. Finally, the last weekend in May. Hudson River Audubon had a trip to the Shawangunk Grasslands, about an hour and a half upstate. I got to ride in a Mustang convertible the whole time (thanks Paul!). I got my year Willow Flycatcher and life E. Meadowlark, but we missed Upland Sandpiper, which I had been hoping for. All in all it was a nice trip though and I really enjoyed it. A great way to end a birding-packed May! Veerys were everwhere. This one in Cornwall, CT.